When travelling, you cannot go anywhere without trying the food. Kuala Lumpur (KL) is just like any city. They have their own food as well as food from neighbouring regions. It is hard to talk about food in KL without comparing it a bit to Singapore. Historically, Singapore and KL used to be in the same country. Currently, Singapore is more ethnically Chinese whereas KL is predominantly a mix of Chinese and Malay. Because KL has more Malay people, the food within KL reflects this. In Singapore I could find what I would consider to be more ethnically based food whereas KL tended to either be Malay food or food with a Malay twist. It can be difficult to explain, especially since I have never lived in Malaysia but hopefully any mistakes can be corrected by some of you out there. Satay seems to be the quintessential Malay food, in my opinion. When I was out and about in KL, I often went to the food courts and ordered satay. I love to eat satay and I really love the peanut sauce that it comes with. The last time I ate satay was in Vancouver and while it was good, it wasn’t completely the same. Satay in Vancouver tends to be a little dry and the satay sauce that comes with it is usually not enough. In KL, I would get a large helping of satay sauce as well as some rice cakes and pineapples or other fruit. It was a nice dish and I loved eating it almost every day in KL. In KL, the two main varieties tended to be pork and chicken. While I do enjoy eating both, I felt sad that there was no lamb. I remember going to Singapore and seeing lamb satay. I would love to try it someday but I figure lamb is more Singaporean rather than being truly Malaysian. The other Malaysian food, at least I think it was Malaysian, was the curry or curry like dishes. I had a lot of Nasi Lemak and Nasi something. It is hard to remember exactly what I was eating as I would often just order whatever looked good in the pictures and just eat that. I went to a shop called Mrs. Kwan and had the “Best Nasi Lemak” in Kuala Lumpur. Nasi Lemak is one of the more Malay dishes from what I have read. It is a combination of rice soaked in coconut cream with sides of spicy food, egg, and sometimes a piece of fried chicken. It is a wonderful dish but a little hard on my stomach. I loved eating it but I doubt I could eat it every day. I did have a tough time figuring out what everything was but I did my best and usually anything “nasi” generally had rice. I like to eat rice and most of the dishes I did order were nasi dishes. With the position of Malaysia between India and Indonesia, among other countries, Malaysia is well positioned to take the cuisine of neighbouring regions easily. 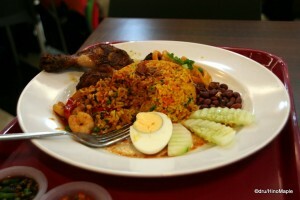 If you aren’t fond of spicy food, you might have a little trouble eating when you are in KL. While I do enjoy eating Malaysian food, I can’t eat it every day. I had a healthy amount of Chinese and western food as well. At the Malaysian Grand Prix, I ate a lot of western food. While at the grand prix, I ordered a lot of sets as they include a side dish on top of the main dish and a drink for free. Most of the time, when I ordered a set I got potato chips. The potato chips I ate were a little different; almost sweet. I also found that the burger and hot dogs I did try were not very good at all. It might be because I ate them at the grand prix so I will have to reserve my judgement till then. I did find that Chinese food wasn’t bad. I tried some of famous beef jerky that is from southern China, Malaysia, and Singapore. It was pretty good and exactly what I expected, sweet dried meat. Unfortunately, I found the dim sum to be poor. I went to a restaurant that had people speaking Cantonese and figured that the dim sum in the restaurant would be good. Sadly, I was let down by what ended up being subpar dim sum for what I usually prefer. 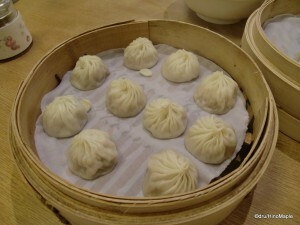 After eating the subpar dim sum, I decided to go to Din Tai Fung, the famous Taiwanese siu long bao shop as I still needed something different compared to Malaysian food. Din Tai Fung is good and something I recommend to people when they visit Taiwan but I don’t know if I’d recommend it in KL. It was very good and almost on par but the wrap wasn’t as good as Taipei. 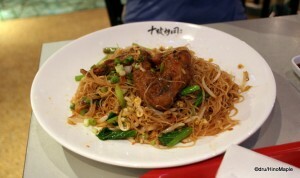 It is a very difficult dish to make and for KL it was excellent, but compared to Taipei, it is just average. Wherever I go, I tend to gravitate to bakeries. I love to go to bakeries and see what is different in each area. KL was no exception as I visited bakeries from time to time. I had time to look and try a few of the buns available. It was delicious all the time and a lot of the ingredients were somewhat unique. I found it to be very similar to the Chinese style of western baked goods yet a little different. Finding shredded meat on everything is pretty natural but I also tried kaya bread. It was bread filled with kaya. As I mentioned in my previous post on Singapore, kaya is a coconut jam that originates in Malaysia/Singapore/Indonesia. The kaya bread was delicious and something I’d love to try again, but I do miss kaya toast. It is one of those dishes that you just can’t help but remember and wish you could eat it more often. In the bakeries in KL, I never found that one food that I had to eat all the time. I ended up trying many different things over my few days in KL and wishing I had more time to try more. KL is a place where you can eat so much and gain so much. All of the food was delicious but it didn’t always agree with me. I had a little trouble at the end of my trip where I had a bit of food poisoning, or heat stroke. Perhaps I had a little of both. If I were to choose one dish that I would miss a lot, it would be the satay. Satay is my favourite food when I was in KL and it shows as I ate it so often. I would also say the Nasi Lemak is on my list of foods I won’t forget. I regret not eating more of it but I was too busy trying various dishes and trying to keep somewhat healthy. 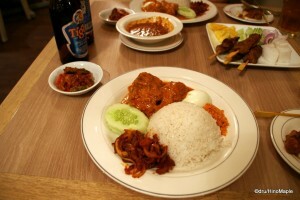 I felt that Nasi Lemak is not the healthiest dish in the world and a little difficult to eat when it is so hot outside. Sometimes having a spicy noodle dish was a lot better than rice on hot days. It really depends on the person but there is so much you can try when you are in KL. This entry was posted in East Asia, East Asia Food and tagged bakery, Chinese Food, curry, Dim Sum, Din Tai Fung, food, Kaya, kaya bread, Kaya Toast, KL, Kuala Lumpur, Malay Food, Malaysia, Malaysian Food, mee, nasi, Nasi Lemak, peanut sauce, Satay, Shao Long Bao, Singapore by Dru. Bookmark the permalink. It’s just as well I don’t live in Malaysia: I’d be obese within a month. As much as I enjoy Japan’s food (and appreciate that it’s so healthy), I do miss spicy food. Not “help, I’m on fire” spicy, but slightly sweet, slightly spicy stuff. Bringing peanut sauce to Tokyo? Great idea. I should’ve done that. Oh well. Not like I will eat much satay anytime soon. We eat LOTS of peanut butter in South Africa! The most popular brand is Black Cat. I’ve heard of Reese’s Cups, but I’ve never eaten it. I just know all my American (specifically) colleagues start drooling when you just mention it. PS: Yup, the typical Japanese diet does have two faults: too much salt, and not enough fresh fruit. Methinks. Malay satay won’t ever come in pork. The pork ones are served by Chinese? In one of the more popular satay place – Satay Haji Samuri; you can have a variety of satay choice : beef, lamb, venison, rabbit, chicken. You didn’t have any Indian food while in KL? Oops. Guess I was eating beef and wrote pork by mistake. Can’t remember now since it’s been a few months. Next time I go to KL, I’ll have to ask you for the name of Satay Haji Samuri again and where it is. Sounds like a great place. Roti Canai, Teh Tarik, sounds like foods I’ll have to find in Tokyo. I wouldn’t mind trying it, but probably way too expensive here for a daily thing. Indian food? I had something similar. 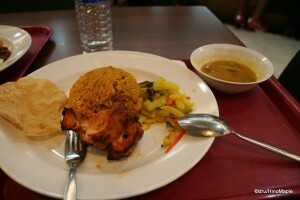 I think it was Bangladeshi food in Suria. That was the closest to Indian food. I had Indian in Singapore and felt I could skip it in KL. Was I wrong?